Paytm is here with another new update! 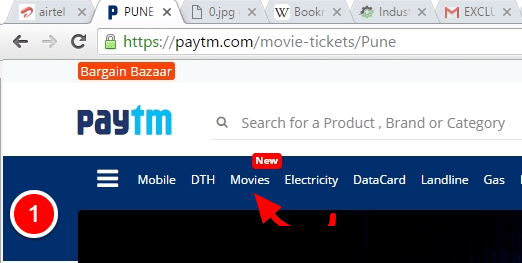 Yes, you heard it true.. Now you will be able to book movie tickets online using Paytm. It’s really a big step in breaking the monopoly of BookMyShow which was there from past few years. Company’s CEO Vijay Shekhar Sharma wants to increase the offline reach in the market and this big move might attract tons of users who never knew paytm and how it works. Get ready to enjoy massive discounts and cashback with our latest paytm movie ticket coupons & offers. Ticket booking procedure is described at the bottom of this post. Click here to visit deal page. It is priced at 400 Rs. Now apply promo code EARLY150 to get 150 Rs cashback. After purchasing, you will receive coupon code by sms. Now use it while booking Shivaay tickets & get 100% discount (max 400 Rs) on couple vouchers. Redeem coupon HWOOD at Paytm and get up to Rs 200 cashback on Hollywood movie tickets. FILM200 : No minimum amount required | valid on single ticket too. Buy 1 ticket & get another free in the form of cashback (200 Rs) | valid till 11th October 2016. FILM100 : Get 100 CB on 2 tickets | valid 2 times per user. MOVIE150 : Book minimum 2 movie tickets & get flat 15% CB. Hurry! It’s a limited period offer. Details :Use it to get up to Rs 200 cashback | 2 times per user. MSD200 or DHONI: Book 2 or more tickets & enjoy up to 200 Rs CB. Use coupon MOVIE75 while booking minimum 2 tickets & get 75 cashback. 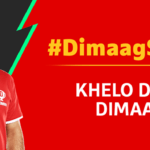 Book tickets & win a car! Details : Offer is valid till 18th October 2016. 1 Lucky users will get Ford figo car while 4 winners will get Mahindra Centuro bikes. Other 30 users will get Samsung Z2 phones while Paytm will give free movie vouchers to 1000s of other lucky customers. Winners will be declared after 30 days of offer expiration. Use coupon code PINK and get upto Rs 100 cashback at Paytm. INDUSIND :Get 100% cb on price of 2nd ticket (max 500 Rs). Coupon is valid till 16th September 2016. Pay Electricity Bills & Get Free Movie Coupon! MOVIEPAY : Make electricity bill payment on Paytm & use this code before making transaction. Within few minutes, you will receive coupon by sms. Use it for booking 2 tickets & get 100% (max 150 Rs) cash back on price of one. MOVIEFEE : Use it and get rid of convenience charges on movie tickets. Use promo code PAYTMFUN while recharging your phone with 25 Rs+ at Paytm. Within few minutes, you will receive app notification containing your unique coupon. Use it while booking 2 movie tickets & get amount equal to price of 1 ticket will be added back to your wallet (up to Rs 150 cash back). FIRSTMOVIE : Avail 100% CB (max 150 rs) on price of 1 ticket. 1] MR100 : Get 10% (max 100 Rs) cash back on Mechanic Resurrection movie. 2] NINELIVES : Get up to Rs 100 cb (10%) on nine lives movie. MOVIE10 : Applicable on all cinemas with maximum 100 Rs cashback. 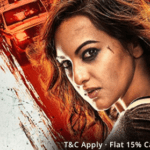 MADAARI : Book tickets for Madaari movie to get flat 10% (max 100 Rs) cashback. STARTREK : Book Star trek beyond tickets & earn upto 100 Rs CB. Click here to visit offer page. Buy coupon for 1 Rs & you can use it while booking tickets worth Rs 500 or more. You will get 80 Rs cash back after using promo code. More offers will be added soon! Obviously, Paytm will be offering tons of cashback & discounts on movie tickets in coming days similar to its recharge offers. Company has also planned to add an option which will enable users to pay for food/value added services right from Paytm wallet. Right now it’s available in almost all metro cities like Delhi, Mumbai, Pune, Banglore + many other. Very soon, you will find lots of Paytm movie ticket coupons & offers in this post as we have already did with BookMyShow. So keep checking this space for upcoming cashback deals & promo codes! How to Book Movie Tickets Via Paytm? It’s super easy! Just follow these 3 easy steps given below to purchase tickets. 1] Visit paytm movie ticket booking page from here. 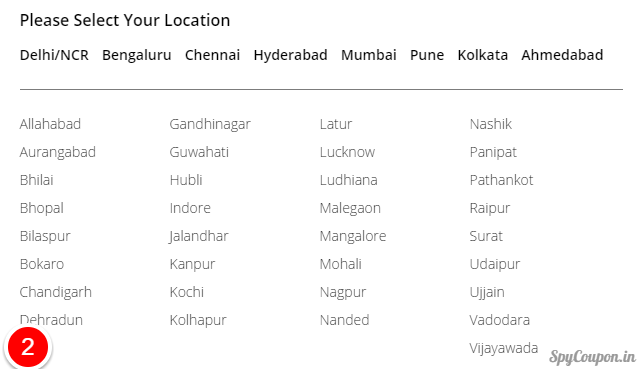 2] Choose your location from the list displayed as shown below. 3] Select show timings and finally pay online using valid credit/debit card. I have lost my faith in paytm. I tried booking ADHM in PVR , it kept saying already booked. 72 empty seats, it still says already booked for every seat that i select.